BEFORE: Last full day at home for Thanksgiving break and for today’s film Steven Soderbergh returns (last directed Traffic in the marathon) for Contagion. This film also stars Matt Damon (last seen in Invictus the other day) in addition to Laurence Fishburne (last seen in The Matrix trilogy last week). AFTER: This is actually perfect timing in terms of placement in the marathon. Contagion begins during the week of Thanksgiving and unfolds over the next several months so placing it right after Thanksgiving was a great coincidence. Contagion deals with the creation and spreading of a new epidemic and what effects that could have on the world. Soderbergh does a brilliant job of making this idea sound plausible and look realistic. Starting with the opening which is light on dialogue but does a great job of showing what’s going on and setting the tone for the rest of the film. There are many shots of hands and surfaces, showing that even right now the littlest form of contact we may be making (whether it be me typing on my keys or the headphones in my ears) can lead to major issues down the road. It’s a good thing I’m not afraid of germs; otherwise I’d probably be dousing everything I own in sanitizer right now. While Soderbergh does a good job keeping this feeling of paranoia and anxiety present throughout the film, I think it did suffer from it’s broad scope. Being a worldwide epidemic, naturally places other than the United States would be shown. For the spread and the effect of the epidemic to be seen clearly, these foreign plot points are necessary but at the same time I felt they weren’t as strong as the rest of the story. The best example I can think of is Dr. Leonora Orantes’ (Marion Cotillard) storyline. Orantes is part of the World Health Organization and is investigating the origins of the disease in Hong Kong. This is an important part of trying to find a cure, but instead of having a higher purpose in the story, like Dr. Cheever’s (Laurence Fishburne) or Mitch Emhoff’s (Matt Damon) stories, Orantes’ felt like a way just to get exposition across. Overall, I was very impressed not only with the story, but the ensemble cast as well. Granted, it was nowhere near as great as the cast of Lincoln (that will be hard to top) but it was some solid acting from all involved (it’s always great to see Bryan Cranston in any role). For anyone who saw Rise of the Planet of the Apes or enjoys a worldwide thriller, you should give Contagion a viewing. 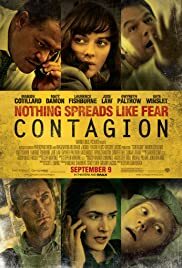 As I mentioned briefly before, if you do have a fear of germs or something similar, you should probably stay far away from Contagion unless you want to lose sleep in which case go watch this film. I will end on this note: the ending was incredibly good and much better than I was expecting as the film progressed.